Weight gain is something that isn’t easy to do and you probably know this already. People who cannot gain weight usually have a high metabolism, which makes gaining so hard. The key to weight gain is to do everything BIG. You have to eat big and lift big, in order to get big. This is your new motto! A lot of people think weightlifting is the key to gaining weight. It is an extremely important part, but the other thing that is just as important is your food intake. Some people gain weight by eating more calories and only doing calisthenics. Some also experience weight gain and weight maintenance while training for marathons by adding a lot more calories and a basic weight training routine. So it is not the cardio that kills your muscle – it is the lack of refueling your muscles after you workout. This requires you to eat both larger portions of protein and complex carbohydrate rich foods. Here is a free sample weight gain plan for you to download. 1. Count how many calories you eat in a normal day. Don’t change anything, just eat like you normally would and count how many calories you consumed. This is extremely important, so try to be as exact as possible. Also, weigh yourself. If you are not gaining weight or losing weight, this number is your baseline caloric intake with exercise. 2. Starting the day after you counted calories, eat 500 calories more than you normally do. For example, let’s say that the day you counted calories you counted 2000 as your baseline. For the rest of the week, you would now eat 2500 calories a day. Instead of eating 3 big meals a day or eating all day all the time, spread those calories out over 5-6 smaller meals. Eat one meal every 2 and a half to 3 hours. To get big, you have to eat big! Remember that. Adding more peanuts, almonds, even milkshakes will help you add great protein and healthy fats (in the nuts) and many calories with little effort. 3. Weightlifting! Get in the gym and lift! This is another important step to gaining weight, so make sure you are doing it correctly. If you do not have weights, go with a TRX, pullups, and dips since together they are the heavy exercises in the calisthenics world. Adding body-weight squats or holding dumbbells in your hands while squatting / lunging is an easy way to add weight to your resistance muscle building routine. For more of Stew’s ideas on this, read Multi-Joint Dumbbell Exercises. 4. At the end of the week, weigh yourself again. You’ll notice you are gaining just after one week! Now, don’t expect to see a 10 pound increase. Gaining anymore than 1 or 2 pounds a week is unhealthy and means you are putting on way too much fat or water weight. So look for 1 or 2 pound gains at the end of the week. You can be gaining 5 to 8 pounds in a month, so be patient. 5. It’s important to remember that, at some point, you will stop seeing weight gain. When that happens you will have to eat even more. So, when you stop gaining for at least 2 weeks, it means it is time to start eating an extra 250 calories a day. Every time you see you haven’t gained weight for at least 2 weeks, add an extra 250 calories until you have reached your goal. Then it is even more important to keep working out. Do not just eat to get big, work out to get big too! — Stay away from too much fat! Even though weight gain is your goal, you don’t want to be getting all your calories from fatty foods, thus gaining fat. Get rid of the chips and candy. No more fast food, nothing fried. Stick to high protein and high carb / low fat foods like tuna fish (and other seafood), chicken breast, turkey, ham, lean meats, fruits and fresh vegetables. — WATER! Drink plenty of water! Drink around a gallon a day, more if you can. Yes, that is a lot of water, but it is water that will allow you to gain weight. Just make sure you sip it through the day and do not consume quarts during meals. That will take up space in your stomach. Below is a list of foods you should eat to gain weight. Eat these and add additional helpings if you are trying to boost your caloric intake to 2500-3000 calories per day in order to gain weight — even more if you are very active with your workouts. 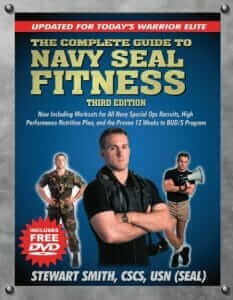 Military Fitness, Navy SEAL Fitness, Nutrition, Tactical Fitness, Workouts bulk, weight gain. Watch this excellent video by former Navy SEAL and fitness book author Stew Smith, to learn tips on how to add exercises into your workout that will improve your balance. People who exercise and those who do not, often neglect the upper back and rear shoulder muscles. Life has a way of bowing your upper back and rolling your shoulders forward. In technical terms, we are basically “internally rotated” within the shoulder girdle. Many things in life “internally rotate” us such as driving, sitting at a computer, playing video games, texting, carrying backpacks, bench pressing, pushups, situps and many more exercises and daily life events. So posture is critical to performance and our confidence. Perfect Posture is possible by adding in a few daily exercises for only a few minutes. Upper back exercise #1 – (Reverse pushups) – Lie on your stomach in the down pushup position. Lift your hands off the floor 2-3 inches instead of pushing the floor. This will strengthen your upper back muscles that balance out the chest muscles. Do 20-30 reps. Rear deltoids and rhomboids are the muscles used. Upper back exercise #2 – (Birds) Lie on your stomach with your arms spread to the height of your shoulders. Lift both arms off the floor until your shoulder blades “pinch” and place them slowly in the down position. Repeat for 20-30 repetitions mimicking a bird flying. This simple 3-4 minute program will help you keep your spine in proper alignment and fortify your delicate shoulder girdle. If you neglect these smaller muscles of the upper back and rear shoulder, all it will take is a fun toss of a football, baseball, or over head smash of a volleyball and your rotator cuff muscles will be talking to you immediately. Watch this excellent video by former Navy SEAL and fitness book author Stew Smith, to learn tips to prevent muscle cramps when running. Learning to breathe during exercise has benefits such as preventing dizziness during activity, improving athletic performance, and increasing fat burning. What is proper breathing while running? What about breathing and training/lifting? Proper breathing during exercises where you exert yourself — such as lifting, pushing, or pulling — is much easier to remember and control than the 3:2 ratio during running long distance. To put it simply: always exhale on exertion. For example, when you are pushing a bench press off your chest, you exhale on the push and inhale as you bring it slowly to your chest. When you are doing a pullup, you exhale on the pulling up motion and inhale on the way down. Breathing during exertion is important in preventing internal injury such as hernia, blood vessel strain, and high blood pressure. Because weight lifting and and other types of training can be potentially harmful when done incorrectly, it is advised to get clearance from a doctor before performing too much – too soon. To decrease that pressure, focus on breathing deep all the time — during workouts and in your daily activities. How does more oxygen help to burn more fat? Basically, the body needs water and increased oxygen to burn fat as an energy source. The water intake should be anywhere from a half gallon for women and up to one gallon a day for men. The increased oxygen consumption will assist with the other part of the equation. As you add more water and oxygen to your system, your body will be able to use the retained water for excretion, prompting almost immediate weight loss of retained water and toxins. This is not the same as sitting in a sauna and sweating which actually dehydrates you. Adding water will re-hydrate you and enable the body to burn more fat (as long as you increase your oxygen intake by doing some form of exercise). Walking, swimming, biking, jogging, calisthenics, and even yard work can help with working your cardiovascular system. Try the deep breathing rhythm during running or working out and see for yourself how you will perform at a lower heart rate and have more energy for a strong finish. STEWART SMITH, USN, is a graduate of the U.S. Naval Academy, a former Navy SEAL, and author of several fitness books including The Complete Guide to Navy SEAL Fitness, The Special Ops Workout, Maximum Fitness, and The S.W.A.T. Workout. Running injury free requires near perfect technique, great shoes, possibly the addition of orthotics/insoles, and a gradual build-up after long periods of no running or beginning a running plan. Below is a Beginner Running Chart for people seeking to start an exercise plan and need to lose 20+ lbs: (always start your run workout with a quick 5:00 walk and light leg stretch). The RUN / WALK method is highly recommended as you are learning to run. * – if you are losing 2-3 lbs this week by simply adding walking / stretching and more water to your life – keep it up until weight loss slows to under 1 lb per week. Running When Overweight – The human body is built for survival and is quite resilient to most of the stresses we can throw at it; however, the knee is not designed to take too much excess weight even through a pain free running program. Usually meniscus and articular cartilage will wear away exposing bone on bone and premature arthritis. This takes years though. So, if you are over 40 lbs overweight replace walking/running everyday with some days of non-impact aerobics like biking, swimming, rowing or elliptical gliding. Read more about proper running techniques to prevent injuries and get the most out of your running workout. Breathing – Take big, deep inhalations and exhalations similar to the way you yawn. This will help you receive the oxygen your body needs. Too many people breathe too shallow when they run, causing a hyperventilation effect. Slow down the running pace if you need to, but concentrate on your breathing. Stride and Foot Contact – When jogging, open your stride but lean slightly forward to a point where you will land closer to the middle of your foot – not the back of your heel but the middle of your foot – and roll across your foot, pushing off the ground with your toes. But not flat footed! Many people run flat footed, back of heel strike, or on their toes causing stress on their feet, lower back, hips, knees and ankles. You can eliminate this by following the simple audio test. If you can hear your feet hitting the ground when you run, then you are running wrong. It should sound like your shoes are rolling on the ground quietly. Comfortable running shoes will also aid in prevention of injuries. Truly – it depends on if you are sprinting or jogging. If you are sprinting you will run more on your toes and when jogging you want a roll of the foot off the mid foot / top of heel (not bottom of heel). Arm Swing – You should have a relaxed arm swing but very pronounced. Swing your hands from about chest high to just past your hips. The term “hip to lip” is a good way to remember this when you are running. Your arms should be slightly bent but not flexed. Run limp wristed. It is impossible to flex your arms with a limp wrist. Start slowly and warm up – Do not stretch your legs until you have warmed up your body by jogging or biking slowly for about 5-10 minutes. Run every other day if you are just beginning and only add mileage to your run as you feel comfortable. Running is statistically one of the most potentially dangerous exercises you can do, but it does not have to be as long as you remember to do everything in moderation and follow these running tips. So, do not be one of 50% of runners nationwide who injure themselves this year by running too often and incorrectly. Good luck and enjoy probably one of the best weight loss plans known to man. Especially if you are overweight by 20-30+ lbs – running can be downright dangerous for long distances / even sprints. So pick a non impact aerobic activity as you lose weight to avoid the extra impact on your hips, knees, shins, feet, lower back. All of which are susceptible to impact injuries even if not over weight. See this Beginner Running Plan that will slowly take you from walking to running. Here are some ideas for those of you who only have a few minutes a day to exercise. Regardless of the hours you keep, here are some options for you to get in quick workouts that are both affective and will wake you up whether it is done in the AM or PM after dinner. This takes about 3-4 minutes to complete. Refer to this Lower Back Plan PDF provided by Stew Smith for detailed explanations of these exercises. Jumping jacks / Pushups – Do 10 jumping jacks / 10 pushups and repeat the non-stop cycle 5-10 times, depending on your fitness level. This takes 3-5 minutes if you push all 10 sets. Jumping jacks/ Squats – If you want to add in a leg workout, try replacing pushups in option #2 with squats. If you select one of these to do, it only takes about 30 seconds per set. Mix in a few sets of each exercise and you have completed a challenging and effective full-body workout cycle. Visit Stew Smith’s website for detailed photos of how to perform these MJDB exercises. Cardio option – You can skip all the above and just run, bike, walk, elliptical glide, or row for 15-20 minutes or you can add in a quick burst of cardio for the remaining time you have.